“Vieni, Imeneo! 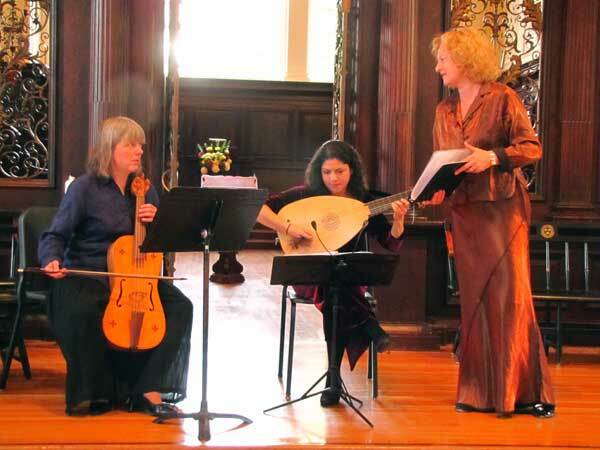 Marriage & Music in the Italian Renaissance” on Sunday, October 31, was The Boston Camerata’s engaging season opener. Conceived by its Music Director Emeritus Joel Cohen in 2008 and originally commissioned by the Isabella Stewart Gardner Museum, the program was divided into five sections and performed without intermission. This was my first time hearing Boston Camerata, and I was enchanted. It seemed that most of the large audience in Harvard’s Memorial Church were among the legions of devoted Camerata fans. I soon found out why they loved this group. Before each section the charismatic Anne Azéma, artistic director, mezzo-soprano, and when needed, conductor, was a charming guide to music and its history. 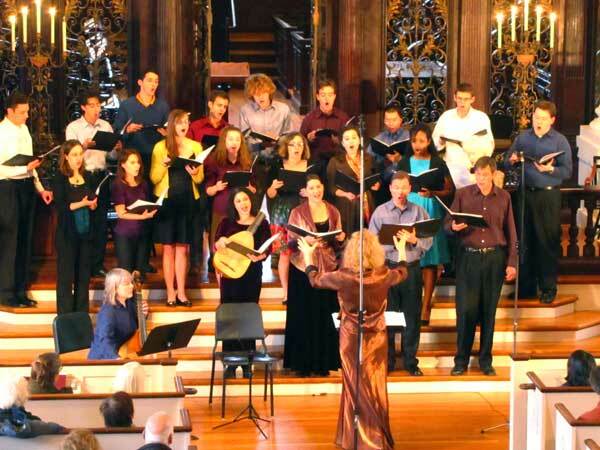 Camerata’s “Marriage and Music” was compelling for its inspired choice of music and texts, its constantly shifting personnel and sites from which the music was emanating. Rarely would two pieces use the same singers or players, although each time the three sackbuts — kinder, gentler trombones —played, I would have been happy to spend the whole afternoon hearing them. 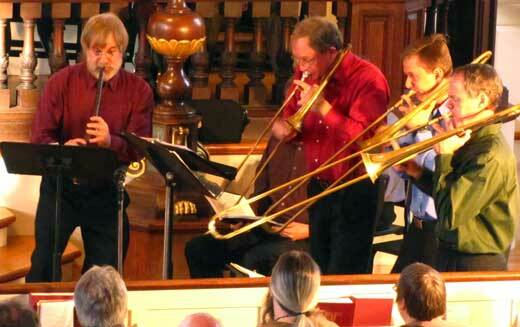 Steven Lundahl (who also played shawm and recorder), Mack Ramsey, and Brian Kay were that good. The sixteen Choral Fellows of the Harvard University Choir directed by Edward Jones were first heard from a space off stage to the right singing Antoine Brumel’s (c. 1460-c. 1512) Sicut lilium inter spinas (“As the lily among thorns, so is my love among the daughters”). Anne Azema sang several songs with great charm, accompanied by gamba and lute, played by Salome Sandoval, who doubled as excellent soprano. Regrettably, the lute was overpowered by the gamba; it was audible only when coupled by the smaller vielle, both played expertly by Carol Lewis, or alone with a singer. For each piece, the Camerata singers and instrumentalists, and eventually the Harvard singers, appeared in different permutations, each with different sounds and even personalities. Often they would surprise the audience with sounds coming from different places off stage. The songs, composed some five hundred years ago mainly in North Italy, felt fresh and beguiling. The longest section Epthalamium (VI) involved the wedding feast, which once again began with a Gregorian chant featuring the excellent tenor Daniel Hershey followed by a yet another wonderful Canzona for sackbuts and cornetto, who appear a few minutes later in a lovely piece by Thomas Campion (1567-1620). A highlight of this closing section was the impassioned plea by the great Claudio Monteverdi Si, ch’io vorrei morire (“Yes, Love, I wish to die, now that I kiss the beautiful mouth of my heart’s desire”), hypnotically delivered by five singers. The official program (pre-encore) was all about joy and having a good time; everyone in the Camerata and Harvard group gave an exuberant performance. We had already experienced and gotten to know the singers and players in small ensembles, so to experience them en masse felt festive indeed. A good time was had by all, on and off-stage. Sounds like a wonderful concert. Wish I cold have been there.